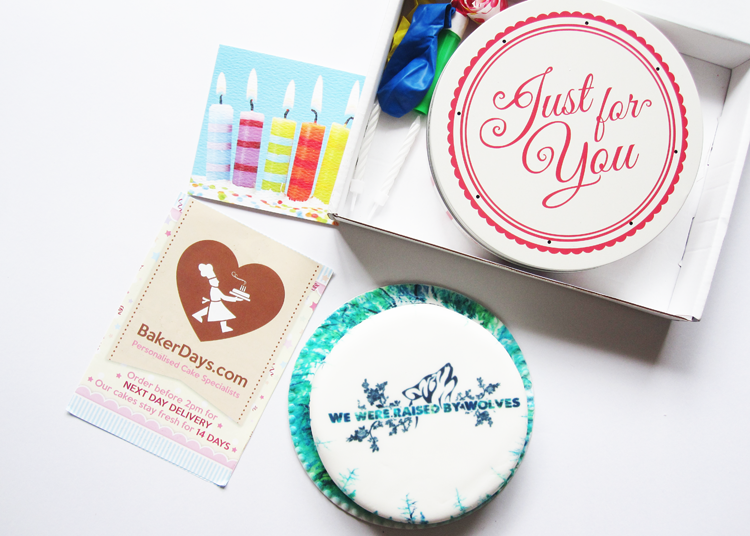 Foodie Friday: Baker Days Personalised Letterbox Gift Cake review + UK Giveaway to win your own cake! To make today that little bit sweeter, I'm happy to announce a special giveaway with Baker Days, where you can win your very own personalised letterbox gift cake! As a blogger, it's always exciting to receive emails from companies asking me to review their products, but this is the first time I've ever been asked to review a cake. Having a sweet tooth, I had to say yes of course! Baker Days specialise in creating personalised cakes which are designed for any occasion you can think of (and let's face it, if there's cake involved, it's always going to be a good event!). They do birthday cakes of various sizes, and also sell a range of cupcakes too, in addition to their personalised Letterbox Gift Cakes, which, yes you've guessed it, fit through your standard sized letterbox so you don't need to spend the day waiting at home for a courier to drop it off. You can have any image put onto the cake and you can choose what size and flavour you'd like from the options available. Baker Days very kindly asked me to review one of their personalised letterbox gift cakes and it arrived promptly through the letterbox as promised. I opened up the box and was greeted with a lovely tin entitled 'Just For You', which was accompanied by a card, a set of balloons and a novelty party whistle. 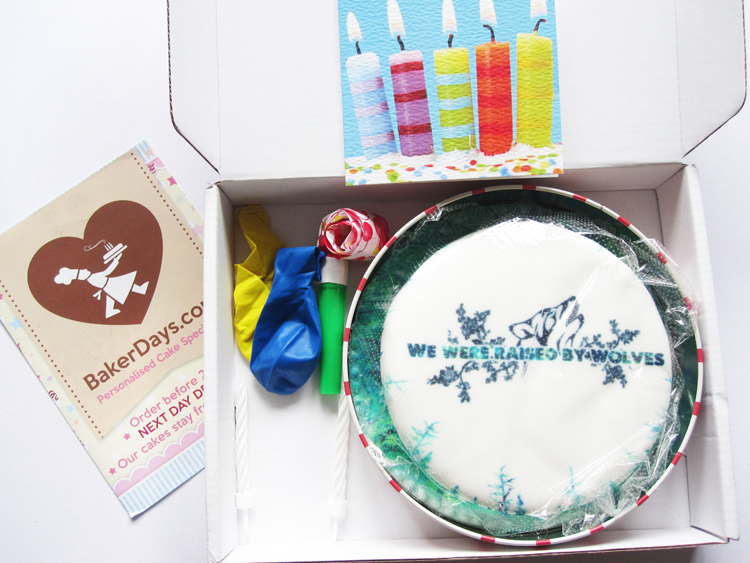 Inside the tin was my personalised letterbox gift cake and obviously I had to get one with my blog logo on it! It was so cute that I really didn't want to cut into it, but I had to give it a taste for review purposes! 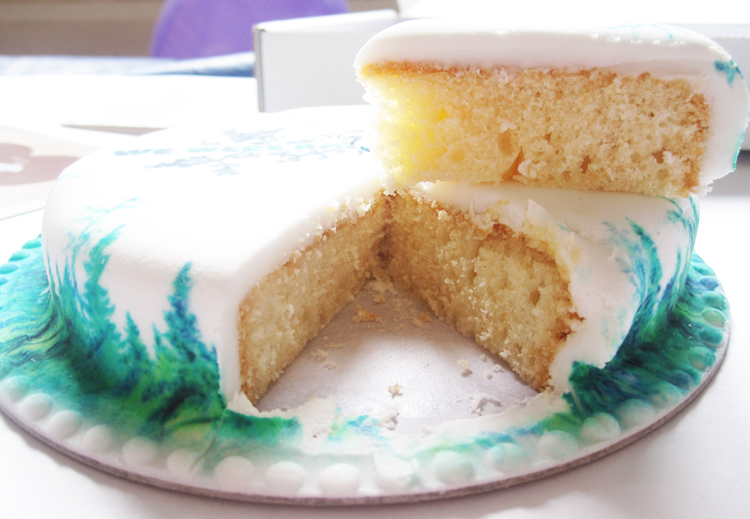 The cake was made of a simple but sweet vanilla sponge and was topped with a thick layer of icing. The sponge was pleasantly soft and the icing was just the right amount of sweetness before it gets too sickly. It's not a gourmet cake by any means (nor does the company say they are), but I thought it was of a much better quality than say a standard supermarket sponge cake. Regardless, I was happy to share it with my housemates and they all enjoyed it as much as I did! 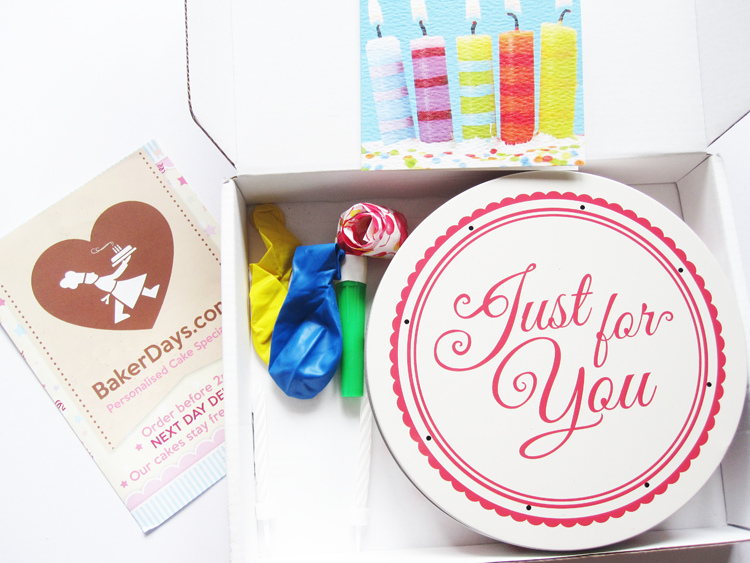 Baker Days Personalised Letterbox Gift Cakes* start from £14.99 for a personalised 5 inch cake. For more info visit their website here. 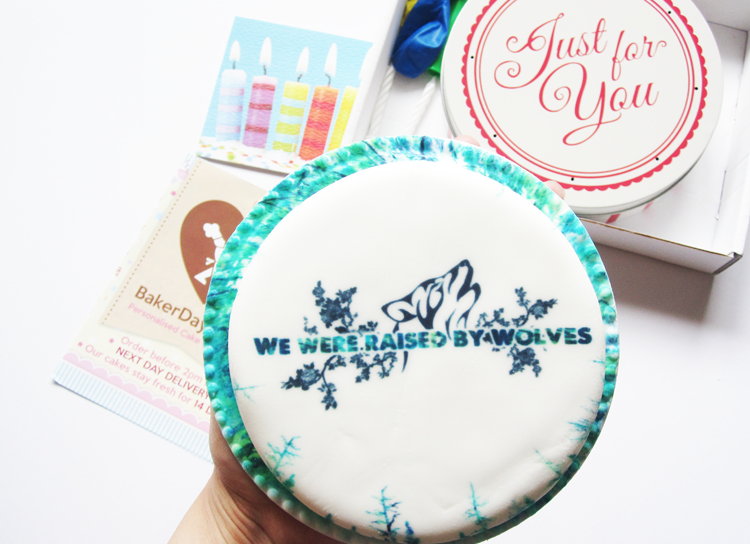 So here's the fun part - Baker Days are kindly giving away one of their delicious personalised letterbox gift cakes to one lucky We Were Raised By Wolves UK reader. To enter, simply fill in some details into the Rafflecopter below and I'll let it choose a winner at random on 21st August (next Friday). Good luck! Its my partners Birthday next month and we love cake. These are such a cute idea. I'm loving the review and there's free cake! I would like to win this for my partners birthday on the 14th of September, They look and sound great. I have seen several reviews of these and I would love to try one. I'd like to win because I love food especially cake, so wouldn't say no to this one aha!! I'd love to win a little cake and choose a design to ask my best friend to be my bridesmaid as I'm planning my big day and think it'd make a great way to ask! It's my husband's 40th birthday in October so I'd love to win this for him! I would love to win because I keep reading about these cakes and am desperate to try one please! I lurvvve cake, plus I'm due a lil boy next month so this would be perfect to celebrate!